Did you know over 368,000 folks search for deviled eggs recipes in any given month? You would think with something as easy as making deviled eggs that everyone would already have a favorite recipe. But apparently, that’s not the case; according to Google, there are over 12 million deviled egg recipes floating around the internet. So I thought it only fitting that I add mine to the fray! Deviled eggs are versatile and there is something for everyone. How about deviled eggs with bacon? Then, there are recipes for deviled eggs with relish, both sweet and dill. 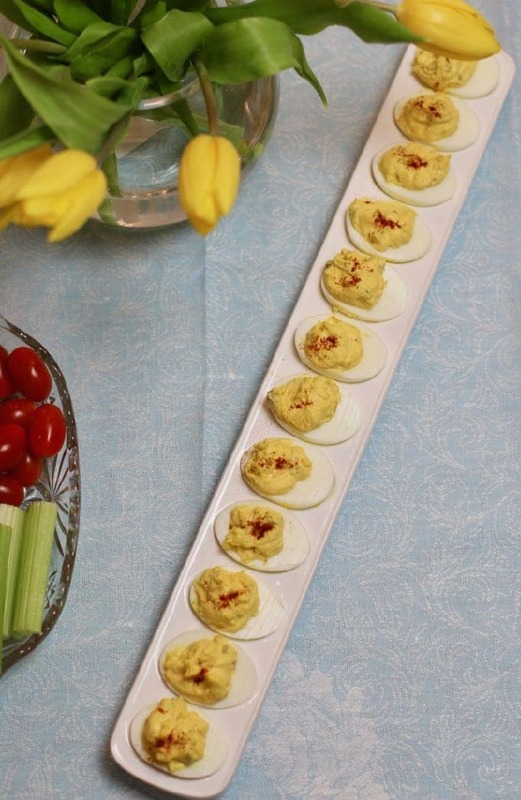 Of course, there are folks who like their deviled eggs without mayonnaise. Sour cream is a good substitute here. And then lots of folks like to add fresh herbs such as parsley and dill. There are as many deviled egg recipes as there are eggs in the South, and we take our deviled eggs seriously. Yes, I know the South doesn’t have a lock on deviled eggs, and they are popular all over the country, but they hold a special affinity here along with Southern Potato Salad, Old Fashioned Southern Cornbread, and Cheese Grits. Coincidentally, all of these dishes would make a stunning Easter Brunch or dinner spread along with my Brown Sugar Bourbon Glazed Ham, and Southern Baked Pineapple Casserole. And, if you are looking for a dessert, well you can’t go wrong with Classic Southern Strawberry Shortcake, Strawberry Trifle with Angel Food Cake or Luscious Lemon Swirl Cheesecake. 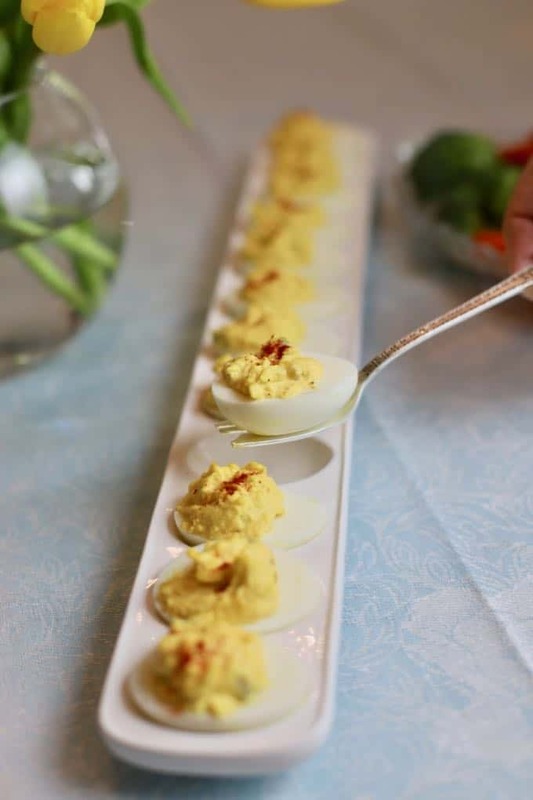 I can’t imagine an Easter brunch or dinner without a plate of deviled eggs. And, on a potluck or picnic table, they are the first thing to go! Yes, I know your family probably has a favorite deviled egg recipe, and the variations are endless. This classic southern deviled eggs recipe is my favorite, and we think they are the best deviled eggs! 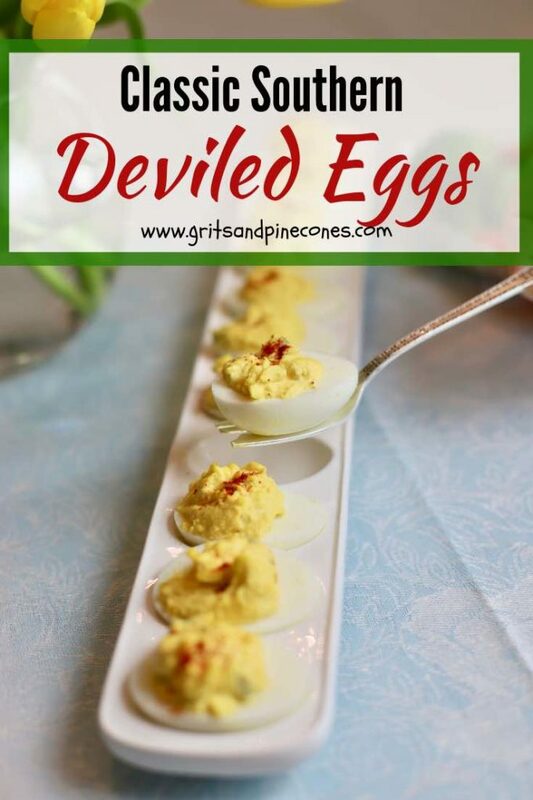 If you are one of the folks searching for a classic Southern Deviled Eggs recipe, I hope you will give this southern-style deviled eggs recipe a try. The only thing hard about making deviled eggs is peeling the eggs. Again, the internet is full of suggestions, but I think steaming the eggs rather than boiling them produces the best and most consistently easy to peel eggs. 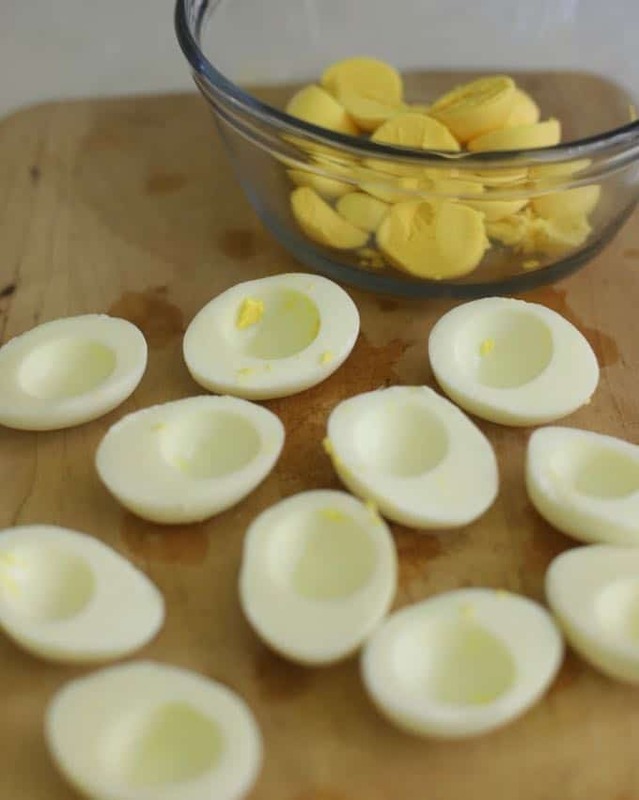 Check out my post, Perfect Easy to Peel Hard Boiled Eggs for easy step-by-step directions. Cut the eggs in half lengthwise and carefully pop out the yolk. Set the whites aside. 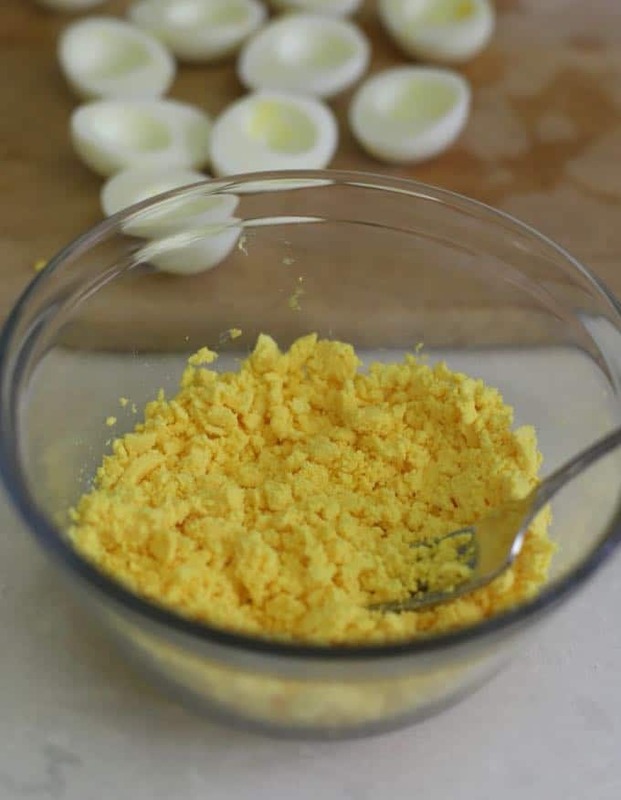 Place the yolks in a small bowl and mash with a fork until they are smooth. Add the mayonnaise, mustard, pickles, pickle juice, salt, and pepper and mix well. Use a teaspoon and fill eggs whites with the yolk mixture. Optional, add just a touch of paprika to the top of each egg and serve. Store deviled eggs covered in the refrigerator. They will last up to 3 days but are best eaten within two days. If you have leftover deviled eggs, they make great egg salad. Simply cut them up and voila, you have delicious egg salad. Leftover deviled eggs can also be chopped up and added to potato salad. 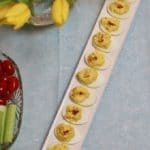 Feel free to substitute dill or sweet pickle relish for the dill pickles in this recipe for deviled eggs with relish. You can also substitute sour cream for the mayonnaise for deviled eggs without mayonnaise. If you want deviled eggs with bacon, simply leave out the pickles and add a tablespoon or so of chopped bacon. If you are topping your deviled eggs with paprika, pour just a little paprika in the palm of your hand and then take a small pinch and sprinkle it lightly on each egg. Don’t try to pour it out of the bottle; you will end up with way too much paprika. 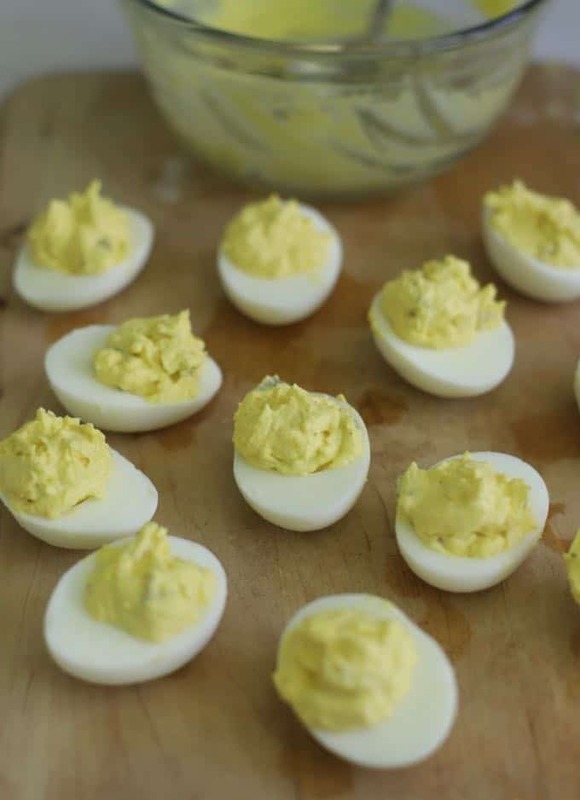 Classic Southern Deviled Eggs are everything you want your deviled eggs to be and more! Hard-boiled eggs, with a creamy egg yolk filling with the usual cast of characters; mayonnaise and mustard. What makes my recipe different is that I add just a little dill pickle juice and of course dill pickle bits. If you are topping your deviled eggs with paprika, pour just a little paprika in the palm of your hand and then take a small pinch and sprinkle it lightly on each egg. Don't try to pour it out of the bottle; you will end up with way too much paprika. Mmmmmmm! Definitely a classic. I do love how versatile deviled eggs are for pretty much any occasion. Also, your tip on steaming the eggs is so fascinating. I have about pulled my hair out many times trying to get the perfect peel. Thanks so much for sharing. Thanks, I have been craving some deviled eggs. Love the egg holder, do you mind telling me where it can be purchased. I love that egg holder too! I’d been looking for one for awhile and wanted it to be a little different from the regular round ones. It is from Mud Pie and I ordered it online from Dillard’s.